Cycling is clean and sustainable, and so the cycling infrastructure should be! Many national and international goals aim to reduce the emission of greenhouse gasses and to carefully use our scare resources and high-quality reuse them. There are already many technological solutions available which contribute to a circular economy. 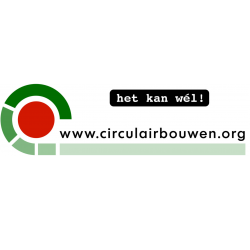 The Circular Building Foundation (Dutch: Stichting Circulair Bouwen) knows and promotes these products and services (circular, bio-based, low-energy or energy generating / road construction, lighting, maintenance etc.) which come from many different supplyers. So all these nice and innovative products, why aren't they implemented everywhere? That is because there are still many obstacles, like procurement rules and regulations, internal financial systems, higher initial costs and products which have not been tested in the long term. Further, there can be found some bad examples of green washing. What is needed is organizing and collaborating differently, finding alternative ways of financing and administration and creating new business models, like products as a service. And that is exactly what we do. We provide both technical knowledge, products and services, and all the tools needed to guide the process toward circular infrastructure (finance, collaboration, new business models, promotion, cooperation with education and governments, etc.). Very important in this respect is our Multi-criteria Analysis Tool by Optimal Planet, which we use for circular contracting, benchmarking, transparency and accountability. We don't want greenwashing, we want firm proof! Until 2020 we manage a two year programme called Hotspot Circular Road Infrastructure, which is funded by the European Union. It's aim is to enhance collaboration and make Sustainable and Circular Bicycle Paths possible. We organize sessions and workshops, and create concrete new pilots and projects. We try to help especially SME's to bring their circular products to the market, to create new circular business. For each project, The Circular Building Foundation creates a learning environment where we involve all parties, public and private, and 'learn on the job.' Together we work step by step toward upscaling.